State police seized more than $5 million in cash Thursday from a tractor-trailer truck found idling on a road shoulder and arrested the driver on a money laundering charge. 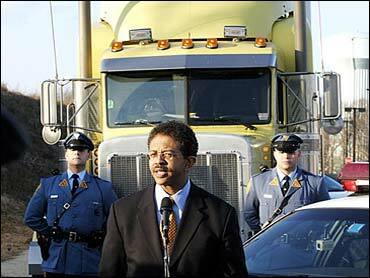 Detectives with the department's safe freight unit placed the truck under surveillance after troopers noticed it had been idling unattended for two days, Attorney General Peter Harvey said. "The cash is the proceeds of illegal conduct, possibly narcotics activity, but that still remains under investigation," Harvey said. Investigators have not yet determined the exact source of the money, he said. Salvadore Delarosa, 46, of San Bernardino, Calif., was seen near the vehicle on Thursday, said Capt. Al Della Fave, a state police spokesman. After questioning Delarosa, authorities found the money in six cardboard boxes stored in the sleeping berth behind the cab. The boxes each weighed about 100 pounds, and the bills were mixed denominations, Della Fave said. Della Fave said a preliminary count put the total at about $5.3 million, which would make it the largest money seizure in state history. However, the exact total will not be determined until at least Friday, Della Fave said. The truck was registered to a California company, but it was not immediately clear if Delarosa was employed by that firm. Delarosa was being held in the Middlesex County Jail, Harvey said, and bail was expected to be set Thursday night. Harvey praised the work of the safe freight team. The unit was established by state police Superintendent Col. Joseph "Rick" Fuentes as part of the state police homeland security operation to identify commercial vehicles engaged in suspicious activity. "The number one priority for me and the superintendent is combating terrorism. We want to get these vehicles before they get to bridges and other critical infrastructure," Harvey said.